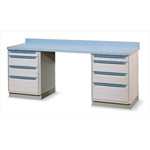 Metro Stationary Workcenter units are versatile, durable and strong. Used in hospitals and labs. Finally, they can be mobile or stationary.